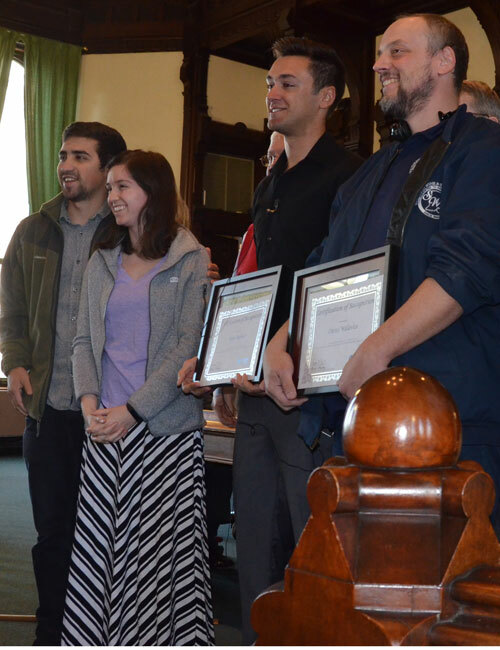 WARSAW — Two men were honored today, Tuesday, March 22, at the Kosciusko County Commissioner’s meeting for their actions that possibly saved the lives of an Ohio couple, who were involved in a four-vehicle crash March 11. Tyler Rothhaar and Chriss Willavize were each awarded a certificate honoring their potentially life-saving actions during the fiery crash that took place earlier this month on U.S. 30 and SR 13, Pierceton, involving two semi-tractors and two vehicles. During the presentation, James Swanson, vice-president for Academic and Student Services at Grace college, told those present that Rothhaar was a student at Grace. Swanson said he talked to some of Rothhaar’s friends on campus and found out that Rothhaar had been in a serious auto accident when he was younger and Rothhaar came out of the accident “miraculously” unharmed. 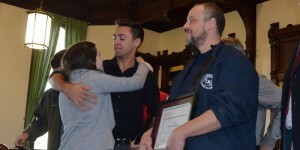 The Columbus, Ohio, couple, Jeremy and Crista Noland, that Rothhaar and Willavize helped that day, were also present at the meeting and showed their appreciation in the form of heartfelt hugs. Scott Tilden, Kosciusko County Highway Department superintendent, requested a permit on behalf of the Backwater Retriever’s Club. The club wants permission to park alongside the road, and on right-of-ways (but not in the way), of CR 1000E, between CR 750N and CR 1000N, North Webster, for April 9 and 10. The permit was approved. The next commissioner meeting will be 9 a.m. Tuesday, April 5.